Abraham Lincoln, the 16th President of the United States, was assassinated by well-known stage actor John Wilkes Booth on April 14, 1865 - a Good Friday - while attending a play at Ford's Theatre in Washington, D.C. He was the first U.S. president to be assassinated, and Lincoln's funeral and burial marked an extended period of national mourning. 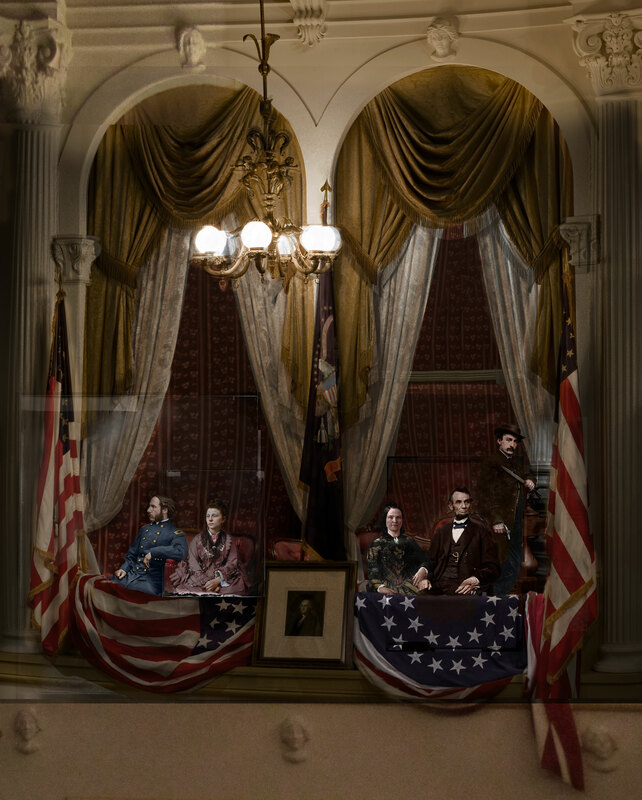 Relying on the limited and deteriorating archive of portraits of central characters and various images of the theatre and actual weapons of Booth, a tragic study of their individual fates and that of the nation are brought together on the visual stage of the presidential box. 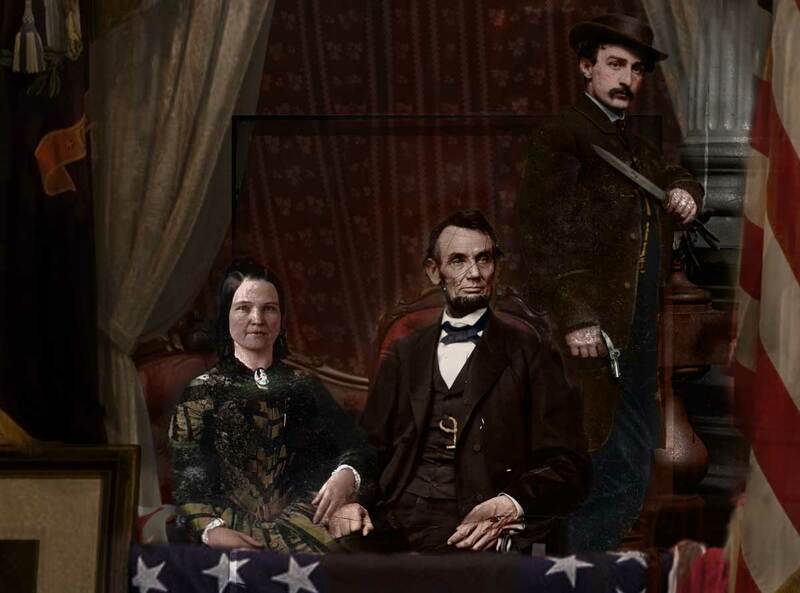 Accurate in place but not in time (the most fitting photograph of Mary Todd Lincoln, for example, is from her mid-twenties when in fact she was forty-six at the time of the assassination). The framed engraving of Washington coupled with the artifacts of the full frames of the originals photographs are pictures within pictures, a lens into the continuing historical divide and ongoing struggles for equality and justice. Booth, an anti-abolitionist, was an ardent sympathizer of the Confederacy and led co-conspirators in a plot to assassinate Lincoln, General Ulysses S. Grant (who cancelled the theatre invitation, Major Henry Rathbone taking his place), Vice President Andrew Johnson and Secretary of State William H. Seward. 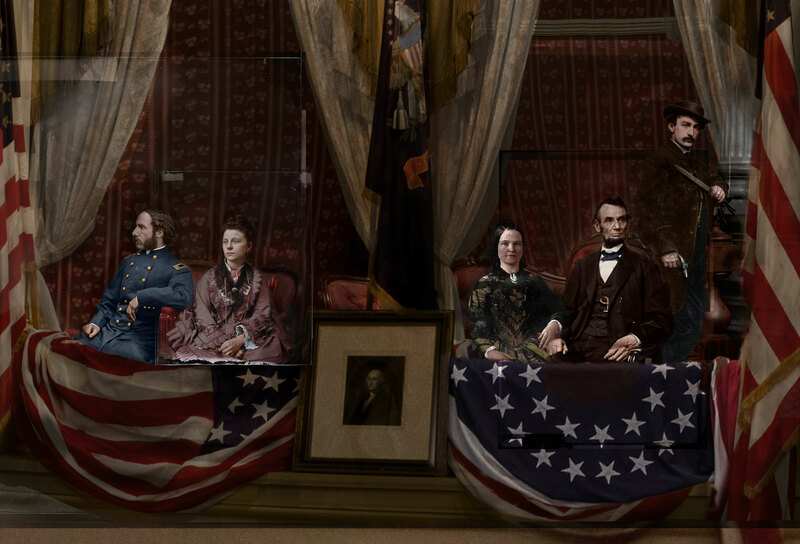 The ensuing chaos in the victorious Union was conceived as a way back into the Civil War for the South. The promise of Lincoln's second term in times of peace are forever lost to this tragedy, both for the re-invented free country and for the individuals accompanying the President. Despite orders to capture Booth alive, he would be shot and killed twelve days later and his four co-conspirators tried and hung; Rathbone deteriorated mentally and was institutionalized for the criminally insane in 1883 after attacking his children and murdering his wife, Clara Harris; and the widowed First Lady's paranoia and erratic behaviour served as grounds for her being commited to a private asylum by her only surviving son (public pressure from waging a press campaign led to her being declared well enough to live with her sister). 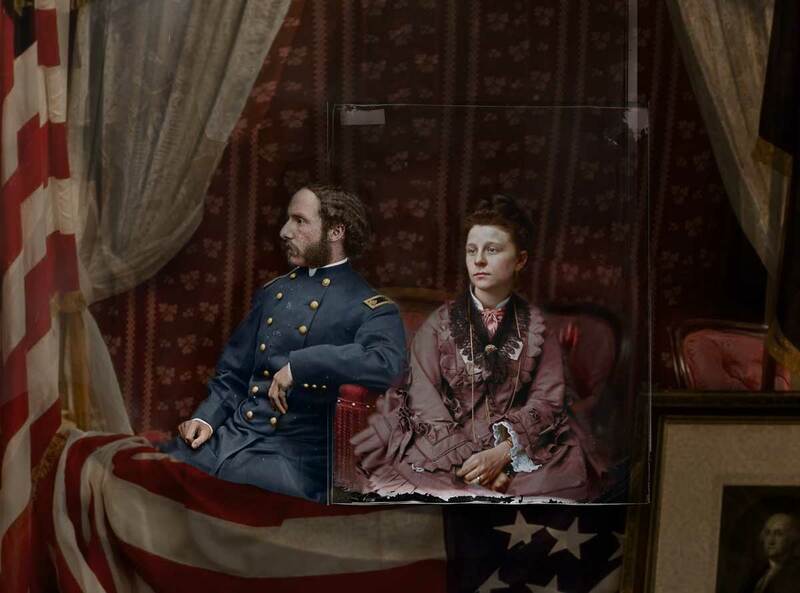 Detail: The presidential box from left to right: Corporeal first-lady Mary Todd Lincoln, and John Wilkes Booth. 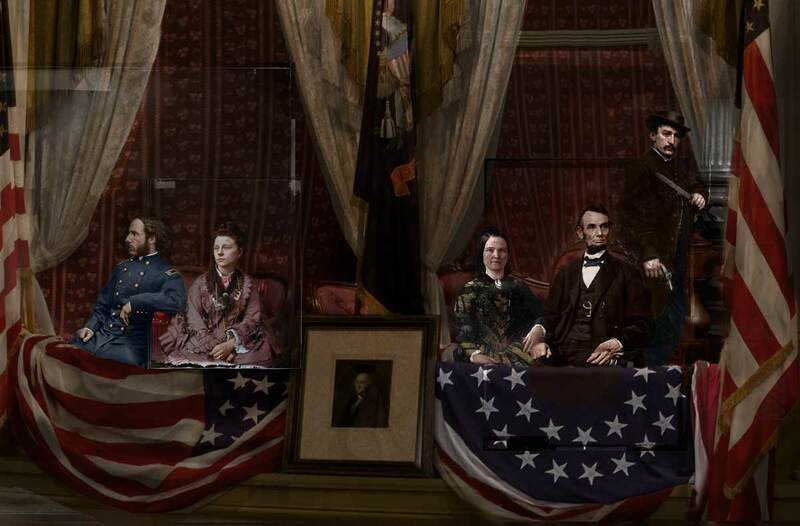 Detail: The presidential box with Lincoln, first-lady Mary Todd Lincoln, and John Wilkes Booth. Detail: Major Henry Rathbone and his fiance, Clara Harris.